Chemical properties of molecules depend largely on whether they are ionized or not. Most organic molecules are capable of gaining and/or losing a proton in aqueous solutions. Proton transfer most frequently occurs between water and any ionizable atom of the organic molecule. The molecule's response to protonation or deprotonation depends significantly on the site that was disturbed by proton transfer. Partial charge distribution in the molecule also varies with protonation of the acid/base active sites. Since the partial charge distribution is very sensitive to the protonation-deprotonation process (both near and far from the disturbed site), it can be used to determine the pKa of a molecule. Our pKa prediction program is based on the calculation of partial charge of atoms in the molecule. When the pH of the solution is equal with pKa, the concentrations of the dissociated and undissociated species are equal. Protonated positive ions are considered as protonated basic sites , therefore "basic" prefix is used for them. The neutral basic sites are predefined in the pKa calculator, they also have the "basic" prefix., e.g. if the submitted molecule is CH3NH2 or CH3NH3+,, they get "basic" prefix and pKa=10.08. Deprotonated negative ions are considered as deprotonated acidic sites , therefore "acidic" prefix is used for them. The neutral acidic sites are predefined in the pKa calculator, they also have "acidic" prefix, e.g. 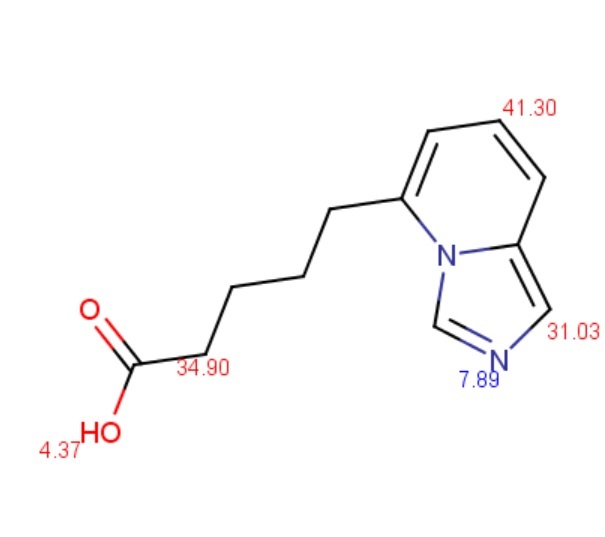 if submitted molecule is CH3COOH or CH3COO- , they get "acidic" prefix and pKa=4.54. When a molecule contains more than one ionizable atom, it is called a multiprotic compound. For these types of molecules we need to distinguish between micro and macro acidic dissociation constants. The micro acidic dissociation constant is obtained from the equilibrium concentration of the conjugated acid-base pairs. The macro acidic dissociation constant is obtained from the global mass and charge conservation law. 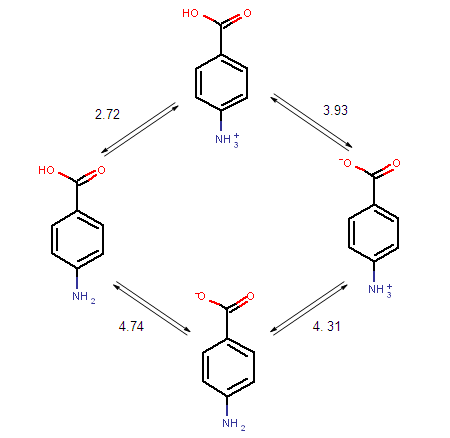 When a molecule has N ionizable sites, the total number of microspecies in the solution is 2N. The ionization process of the AH1H2H3 molecule in aqueous solution is described with 12 equilibrium reactions. Microspecies and their charge are summarized in Table 1. The following examples show the different acidic/basic dissociation processes and their related calculations. The ionization steps of p-amino benzoic acid are outlined below. Calculated micro ionization constants k1, k2, k3 and k4 are indicated on the arrows. Imides and amides can have either acidic or basic character. 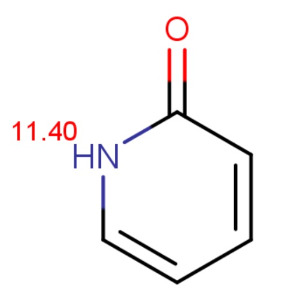 The extent of amide/imide ionization at a given pH is determined by two acid dissociation constants: pKa,1 is assigned to the deprotonation step RNH RN- + H+ ;pKa,2 is assigned to the protonation step RNH2+ RNH + H+ . If 2*pH - (pKa,1 + pKa,2) > 0, deprotonation of the amide/imide is favoured, and the molecule is said to have an acidic character. If 2*pH - (pKa,1 + pKa,2) < 0, protonation of amide/imide is favoured, and it is considered to have a basic character. Chemists often want to know the ionization state of organic compounds at pH 7.4. 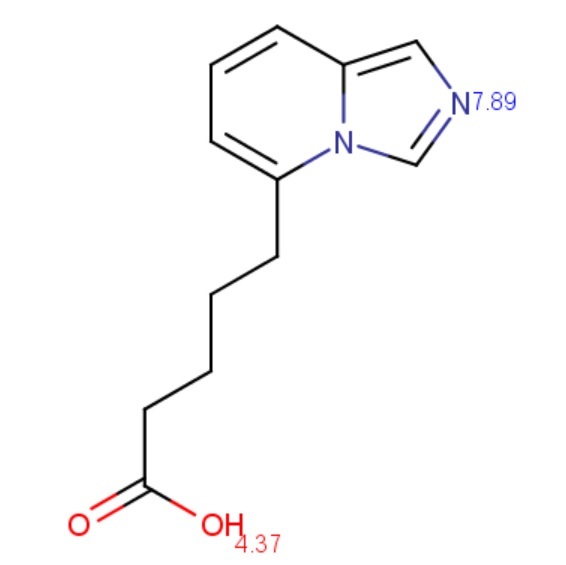 (the pH value of human blood) In general, the macro pKas of amide/imide compounds are calculated and their acidic or basic character determined by the above formulas at pH 7.4. We give as an example two amides: phthalamide and 2-pyridone. Calculated and measured pKa values of phthalimide and 2-pyridone are given in Table 2. The value of ionization constants of conjugated acid/base pairs usually falls between 10-2 and 1016, so these limits are generally used to predict the pKa. 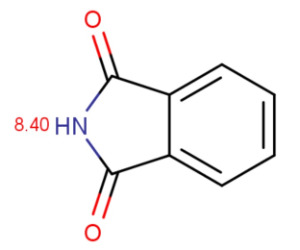 When an ionizable site in the molecule has an ever weaker basic or acidic character, the ionizable site can be involved in the calculation by increasing the calculation range. The molecule depicted below contains a very weak acidic N atom. First, macro pKa is calculated with default limits predefined between 10-2 and 1016. Then macro pKa is calculated with altered limits defined between 10-50 and 1050. Changing the default settings of macro pKa calculation can be done in the Tools > Options > pKa menu of MarvinSketch. Calculated and observed acidity constants are summarized in Table 3. Measured pKas are taken from Clark et al.